Ian Buckley’s gently humorous new offering is a touching testament to 20th century British socialism. Based on his father’s accounts of retired tailors’ trade union meetings, The Tailors’ Last Stand is full of antiquated language and disappointed dreams. But the sentiments of these faded ‘comrades’ also chime potently with the hopes of modern ‘brothers and sisters’ such as Occupy, thus contextualising contemporary struggles. This cast wouldn’t look out of place in Dad’s Army and although they appear a bit shaky on their legs and lines they are a watchable and likeable bunch. As the mischievous Tom, Richard Ward is a warm mediator to Terry Jermyn’s zany George and the emotionalism exploding between old love foes Edmund Dehn – as the officious Max – and Tony Parkin’s querulous Barney. Cleo Harris-Seaton’s lemon-walled NHS waiting room design gives a potent sense of faded grandeur, while the Labour leaders who adorn the walls do a nice job of reminding us what the party meant before Tony Blair. Buckley cleverly ties in the struggles of communism as a global concept with the personal struggles of these retired communists and, apart from a contrived piece of business around a doctor, this is a sharply written piece. Staging ‘Gay’s The Word’ in February is a canny move for the Jermyn Street Theatre: the gloomy weather provides just enough external misery to lift our appreciation of Ivor Novello’s ultra frothy backstage musical. But in this clunky production, even clever programming cannot save Novello’s flimsiest of efforts. 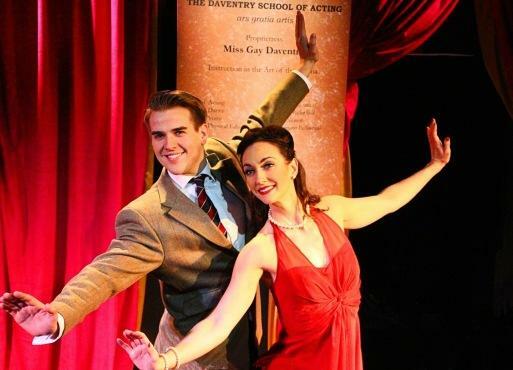 After producing a flop, musical comedy star Gay Daventry (a spunky Sophie-Louise Dann) tries to recoup her losses by starting an acting academy. Through a series of misadventures she and her students realise that the quality they need to succeed is ‘vitality’ – aptly the title of the show’s most famous number. But vitality seems a long way off as Alan Melville’s songs – themselves long-winded – are performed with gumption but no zing. What actually succeeds is ‘grannies doing jazz hands’, with the house nearly coming down when four of the academy’s elderly teachers do just that. A musical cannot live on cheap gags alone however and while there are enough theatrical winks and nudges to keep the audience tittering, director Stewart Nicholls doesn’t have much to work with. For this, his last operetta, Novello descended into the bawdy world of music hall and it doesn’t suit his delicate upper class wit. Nicholls is unable to add coherence to this mêlée and his choreography is simplistic. The cast are hampered by awkwardness and only Dunn and the dynamic Myra Sands as deportment tutor Margaret Fallowfield really sparkle. “I really believe that theatre is encoded into the human DNA.” Playwright David Greig’s has been talking in this vein for about 20 minutes and his enthusiasm is infectious – the kind of voice all theatremakers should want on their side right now. It feels hackneyed to say someone is inspiring but if that tag applies to anyone it’s this passionate playwright who gets carried away with his own sentences and uses more adjectives than an overwrought critic. nspired by the cut glass wit of Oscar Wilde and Noel Coward, this play is a modern comedy of manners. Rodden is Lauren, a ‘resting’ actress, with nothing but her Coward plays and bottles of cheap plonk for company, which – apart from the work situation – is just how she likes it. But soon she is swamped by her feuding adolescent parents and a war of fruity vowels begins. Highly crafted and with plenty of lovingly researched detail, Katherine Rodden’s play is an enjoyable, contemporary nod to a bygone era. However, there are times when it enters sitcom territory as subtext becomes text and too much is revealed. Coward would have undoubtedly found this vulgar and a good deal – including an under-baked subplot involving two suitors – could be shaved off. But the actors clearly relish all the horsing around and the energy on stage is high. Rodden does a neat line in self-obsessed actresses, while Alan Booty as her philandering father is reminiscent of Stephen Fry. When he and his wife – Rachel Dobell – reconcile they do so without bells and whistles, cutting through the froth to provide a flicker of genuine feeling.